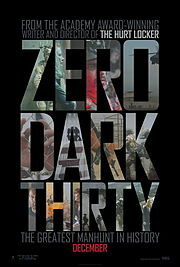 Zero Dark Thirty is a hard film to review. It deals with an important issue in recent US history. It’s well photographed, the settings are realistic, and some of the details are technically interesting. But most of the characters are not very likable and there has been a lot of controversy over its depiction of torture. One of the films major flaws is the lack of likable characters. The female lead, Maya (Jessica Chastain), is single-minded and dogmatic. Being obstinate and dogmatic can be a good thing when you’re right, but a bad thing when you’re wrong. Fortunately for her, luck – and some clever guess work – were on her side. But the viewer doesn’t feel a great deal of empathy for her. She appears to have no friends, no contact with any family (if she has one) and no activities outside of her work. The photography is excellent. The film does convey the sense of isolation the Americans must have felt working in these remote, fortified dust bowls. The settings looks realistic: parts of the film were made in India, with certain buildings altered to make them look as though they were filmed in Pakistan. The tension builds throughout the film as we are shown the bombings in London and Madrid, which give a sense of the pressure the main characters must have felt as they tried to find clues to the next likely terrorist attack against the world. It’s hard to say if the film should have included torture scenes or not. If they had been not shown, the producers would have been accused of “whitewashing history.” As it is, they have been accused of producing a film that justifies torture. The problem with torture is that once you say ‘yes’ to using torture on a known terrorist to get details of a the next possible attack, where do you stop? What about the guy who is a strong suspect? A weak ‘possible’ suspect? A guy who you don’t think is a terrorists but who knows something about people who may be? And if ‘yes’ to terrorists, would you torture a serial killer suspect like Ted Bundy, while he was still only a suspect? And after that, who? Overall, the film well made, well acted, and has been nominated for several Oscars. If it wins, the controversy about its depiction of torture will flair again. Is it a “must see” film? No. For all the interesting detail about how bin Laden was tracked down, the film remains a technically well-made film about a group of people it’s just hard to like. So, has anyone seen the film? What did you think? super article you got here, thanks a lot for making it available!